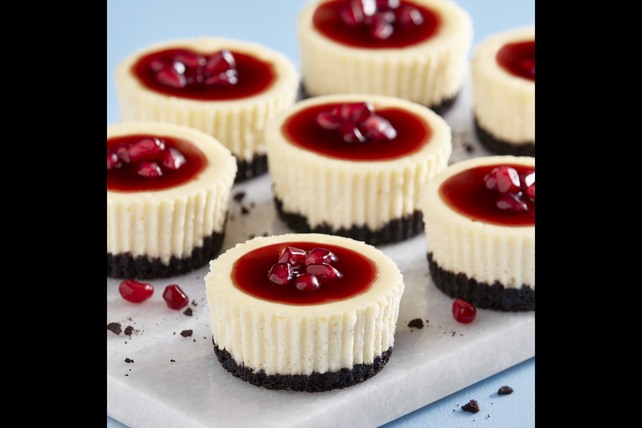 Serve up some sweetness next time you entertain with Chocolate-Pomegranate Cheesecake Minis. Black, white and topped with a pomegranate sauce and seeds, Chocolate-Pomegranate Cheesecake Minis look like they're ready for a formal affair. Plus, they taste pretty excellent, too! Combine cookie crumbs, butter and 2 Tbsp. sugar; press onto bottoms of 24 paper-lined muffin pan cups. Beat cream cheese, vanilla and 1 cup of the remaining sugar in large bowl with mixer until blended. Add eggs, 1 at a time, mixing on low speed after each just until blended. Spoon over crust. Bake 20 to 22 min. or until centers are almost set. Cool completely. Refrigerate 2 hours. Meanwhile, bring pomegranate juice and remaining sugar to boil in saucepan; simmer on medium-low heat 14 to 16 min. or until thickened, stirring frequently. Cool completely, then refrigerate until ready to use. Spoon pomegranate sauce over cheesecakes just before serving; sprinkle with pomegranate seeds. Balance out your choices throughout the day so you can enjoy one of these mini cheesecakes. You will need to crush about 28 chocolate wafer cookies to get the 1-1/2 cups crumbs needed for this easy-to-make crumb crust.